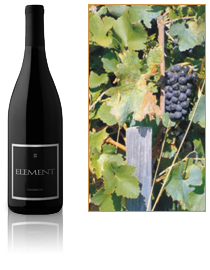 Element is a modern sophisticated, dynamic and elegant wine brand, displaying the full potential of our vineyard and winery. 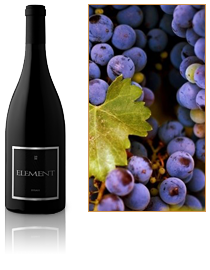 Well balanced, nicely structured and intensity of flavors, we are sure a bottle of Element wine will make a special touch to any occasion it is savored at. Chardonnay grapes are relatively hardy and are able to survive in a variety of environments. Chardonnays have also become very popular, probably the most popular of all white wines today. It thus for good reasons that Chardonnay is regarded as the “king” of white grape varieties. 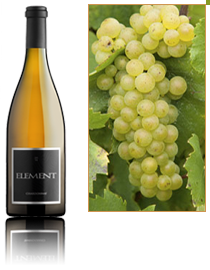 This style of chardonnay is stainless steel matured and fermented. The refreshing acidity leads to a hint of crisp green apple. Pinot Noir wine is produced from red grapes but it is much lighter in color than other red wines. Pinot Noir flavors and aromas include roses, fruits, black cherry, berry, and currant. 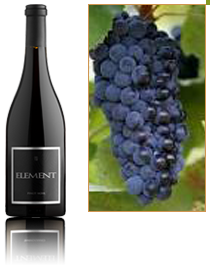 Other Pinot Noir characteristics include high acidity and low tannins. Pinot Noir’s flavor depends heavily where it is grown and how the wine maker treats it, Santa Maria Valley produces some of the best Pinot Noir in the state of California. 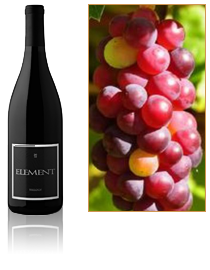 The Element Pinot Noir has a fragrance of cherry, spice and red gooseberry fruit, firm structure, aromatic taste and compact acidity form a nice balance. This is good wine with a strong fruitiness. Syrah is one of the oldest wine grape varieties, originating in France. Because of California’s unique climate it is too widely cultivated here. The grape is round and dark purple with medium thick peel, flesh soft and juicy with sweet and sour taste. Syrah is considered as the “Prince “among red grapes, and grows well in warm climates. This Rhone inspired Syrah has a rich taste and lovely tasting notes of white and black cracked pepper, chanterelles, huckleberries, graphite and backyard plums. Fine, elegant tannins are prevalent, as is a long, lingering finish. Balanced and nicely structured during the wine making process, we feel our Syrah is a dynamic representation of our vineyard’s potential. Grenache is the world second largest type of grape. Black Grenache grows in Spain and the South of France. It adds spice to Rioja wines and makes Rioja wines stronger. Grenache is also the powerful force of the ‘New Castle of the Pope’ in the Rhone Valley. In hot climates, Grenache wines have an aroma of juicy plums and vanilla. The flavor of our estate’s Grenache is juicy black plums and vanilla of Provence. Because of its fine, elegant and appealing taste, wine makers compete to use it to create a wonderful feeling during harvest season. There is a floral core to this wine that tends to be rose-like in its aromatic profile, which provides a sense of pleasure to drinkers. It’s best when paired with chocolate flavor deserts. Dolcetto means “a little sweet”, it expresses original fruit flavor of grapes. Dolcetto is the earliest maturing grapes among the three main red grapes in Piemonte, Italy. It is very sensitive to the soil and climate, the leaves are a small pentagon shape, and there are five leaves normally. Long conical bunch of grapes support the dark blue and purple grapes, tannins of the latter grapes is medium. In general, Dolcetto has natural fruit flavors such as quinces and almonds and bright in color. Our Dolcetto have natural fruit flavors such as quinces and almonds and is bright in color. 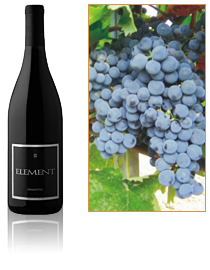 The wine body of Dolcetto is very appealing, and has a color of dark ruby. It tastes like sweet berry, cypress tree and almonds. If you love wine with rich red and black berry aromas, then Syrah will be your best choice; If you love wine with not only rich color but also with a plump taste, then you will have to choose Dolcetto. If while you enjoy the rich fruit aromas, you also want to experience the fresh and smooth taste, then Grenache will be your best choice. And because these three types of grapes that can be easily are fermented, winemakers love to use all three of them, for blending, in order to create different colors and flavors. Our Trilogy is our personal favorite Element wine. It is a blend of various varietals, including Syrah, Grenache, and Dolcetto. This wine has been aged in neutral and newer French oak barrels. It is well integrated in its youth, with subtle hints of tobacco leaf, mocha and blackberry. A bold, luscious wine, it shows best when paired with formidable meals, including prime rib and filet mignon.